Hyperlinks in exported PDF have lost the location they were linked. The dialogue box when exporting does not provide any info on which links this has happened. Is it possible to have a list appear when this arises? Is there a way to globally remove ligatures from a document created with pasted text? Where can I turn off the use of ligatures if I do not want the pasted text to use ligatures? Ap is crashing when turning off "Facing Pages" on a document of more than 5 pages. Is there a way to create a radial gradient that progresses from the edge inward instead of a center point outward? Please note, I am not looking to create a glow effect. Stop workspace from repositioning left each time a row is deleted. For that matter prevent the workspace from moving at all unless directed by the user. Also, when changing column widths hide text instead of squashing it. Current build 1.7.0.277 crashed when resizing table column. The column became too narrow, and when attempting to widen, AP crashed. Having a crash report submission or popup would be a good idea in any software. Thanks for the assist. I think this will work for now as a placeholder. I will likely be creating a custom asset for the box later. WOW, thanks for going the distance there. Yep, just figured out that the series of boxes is the stroke location around the text. It became apparent when I hovered over the boxes. There is no real sample document. I am just working through the setting in the Text Styles and observing what happens. In this instance, I just made a text box, inserted filler text and began applying styles to see what they looked like. So my next question is; if I want to change the "BOX" decoration is my only option to create an asset in Designer and use it with body text placed inside it? OK, so the stroke on the outside of the "box" is not cut off, just not present. Changing the stroke setting does not add a stroke to all side either. There are no default Paragraph/Character Styles in Publisher. These are just sample styles. If you don't like them you can delete them or modify them to whatever suits your needs. I understand that. 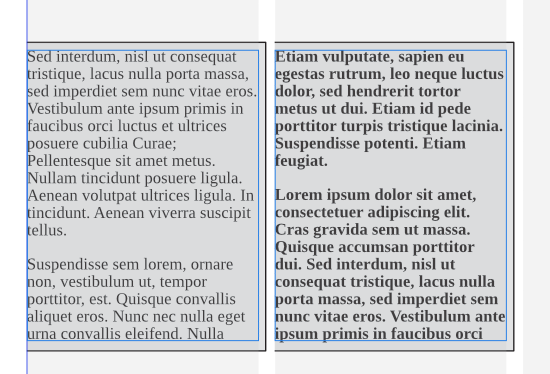 What I am asking is that when applying the sample BOX style to text the "BOX" is outside the text frame. I have tried to adjust the settings in the decorations window, but nothing seems to be happening. I have looked through the help menu, but there is nothing that provides a decent explanation of how to work with or manipulate this particular style. Is it supposed to be the default that when applying the Box text style that the "Box" decoration is outside a text frame? There is an active, helpful, forum for High-Logic products. It's an opportunity cost thing; the more time I spend getting the font right myself and learning Font Creator, the less time I spend working on learning AP. Don't get me wrong, FC looks to be helpful. I don't know how much time I want to devote to this sub-skill before I even learn how to use AP for its intended purpose. I tried a test, not with that font but with a capital E acute using Arial and I found that if I do the downward adjustment once, then I can copy and paste the downward adjusted glyph and paste it where else I need it and the downward adjustment that was done before travels with the copy. Currently, that is what I am doing. I have a separate window open with the glyphs in "as best I can" adjusted position. Then I bounce back and forth between them. Well, OK, yes that is from where the font came. Some of the people who produce the fan material are using AI so that they might correct the font in the document, don't know. As for how I will be using it; much in the same way. There is a new book coming out next month that I will be using for the Genesys RPG system. Right now I am just copying and pasting material into AP so that I can use it to practice layouts, mess with styles, layers, groups, text flow, justification and in general learn to use AP properly as well as understand what it takes to do layout work. For example, to achieve the colored die shapes I colored and outlined their glyphs in a key. Unfortunately, I have to copy paste them to use them as well. I download a trial version of Hogh-logic Font Creator, but I was lost. The files below are the ones that I am currently experimenting with; they probably look like a hot mess, remember, I am new to this whole thing and just getting started. The whole process is kinda fun and interesting. If anything it gives me a new appreciation for those that do this kind of work. This depends on the vertical metrics settings in the font. You may be able to just tweak the font a bit. This is the font. It might have been fan created and is used for fans to create non-commercial material. https://www.dropbox.com/sh/8nq0741b41palgu/AAAQoXvkOUmL58cY7FQj6mVLa?dl=0. I don't know enough about font making to be able to manipulate it so that when inserted the center of the symbols is on center with the line of text it is inserted into. I have a font installed that uses some symbols inserted into a line of text. One of the issues I am encountering is that the baseline for the symbols is too high. I know that I can use TEXT>Baseline>>Lower baseline to get the symbols into a good position. However, I am using these symbols quite a lot, so my question is this; how do I get the symbol inserted at the position I want every time without having to move each instance? Is there a way to remove the unused text styles from the window? I have created some basic variations, however, I would only like to see the ones that I am currently using in the document. Just had my first crash with Affinity Publisher. I was surprised to not see any crash report prompt. This might be something worthwhile if possible. I am working on a pet project using Publisher, and this is more of a question than a bug report. 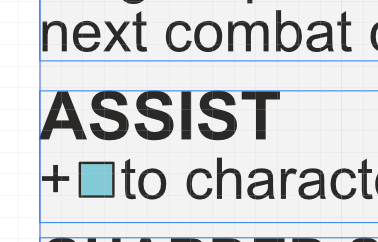 When doing the layout of the text in a box, I am currently using some SVGs as symbols for dice in a game. These are set up as assets for this document. So the text is typed in then I make space for the SVGs. There are some questions though as to how I can make this faster or improve the workflow. So here we go. Can you make colored glyphs and load them in the glyph browser? Is there a way to embed or have the glyphs "locked" to the same layer as the text so that when moving a text box, the text and SVGs move together? Also, is there a more natural way to ensure that the SVGs and the text are better aligned horizontally? Yes we have discovered the cause, as mentioned above by Chris_K. It's logged with the developers and I'm hoping for a quick turnaround on this one. Have I ever said how much I appreciate the work the team is doing? If not, keep on rocking with the development.